The book is a joy, to be kept near at hand and to dip into at random. A must for any lover of the theatre. 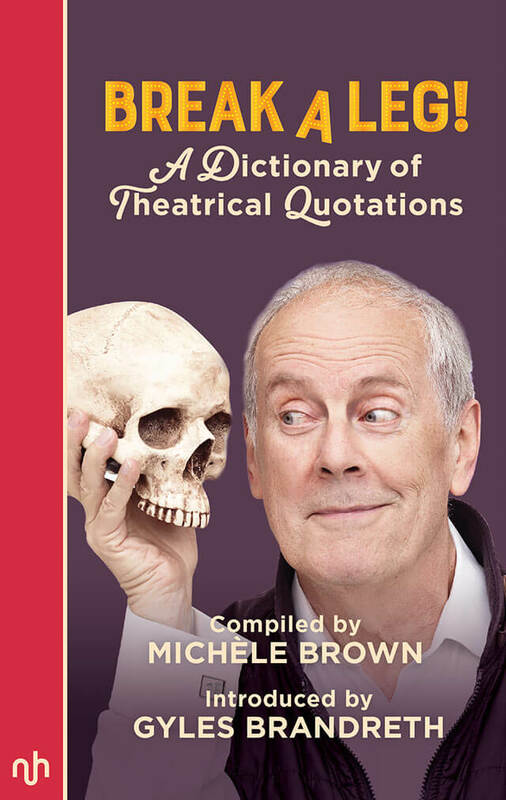 From Aristophanes to Zeffirelli, from Gerard Depardieu to Mae West, in Break a Leg Gyles Brandreth introduces Michèle Brown, who has assembled a world-beating cast, including actors, dramatists, directors and even critics (‘A man who knows the way but cannot drive the car.’ Kenneth Tynan). She draws on plays, books, newspapers and table-talk and her collection of wise and witty lines includes the familiar and the completely unexpected. This is a work where Sarah Bernhardt is playing opposite Kenneth Branagh. Orson Welles is sharing the limelight with Samuel Beckett, Aphra Behn and Noel Coward, and the themes range from stage fright to star quality. Michèle Brown has an MA in Modern History from Oxford University and an MA in Shakespeare Studies from Royal Holloway, University of London. A former television presenter and publisher, her many books include children’s fiction, several anthologies of quotations, a history of royal cookery and a best-selling dictionary of first names. She has worked with her husband, Gyles Brandreth, on a variety of theatre shows both in the West End and on tour – the most recent being Break a Leg a humorous celebration of all things theatrical inspired by her dictionary of quotations. London-based Gyles Brandreth has won the Most Popular Show at the Fringe Award and multiple 5 star reviews in Edinburgh. On stage he has appeared in pantomime, in Shakespeare, as Lady Bracknell in The Importance of Being Earnest and his own musical revue in the West End. Best known as a reporter on The One Show on BBC1 and a regular on Radio 4’s Just A Minute, he has appeared on Have I Got News For You, QI and Countdown. He is an ex-MP, President of the Oscar Wilde Society and Chancellor of the University of Chester. With Michele Brown he has co-curated an exhibition of children’s writers at the National Portrait Gallery, co-founded the teddy bear museum now housed at Newby Hall in Yorkshire and co-presented the Oxford Theatre Festival. This is Gyles’ third title for Notting Hill Editions, with the previous being On Christmas: A Seasonal Anthology and Beautiful and Impossible Things: Selected Essays of Oscar Wilde. 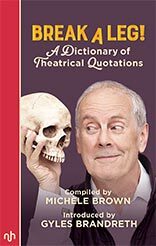 View basket “Break A Leg: A Dictionary of theatrical quotations” has been added to your basket.